The Western Massachusetts Chapter of the National Tooling and Machining Association (WMNTMA) has a rich and long standing history of providing leadership and direction within the precision manufacturing industry in Western Massachusetts. In the beginning, the present Chapter was a small subset of the larger Connecticut NTMA Chapter, and the majority of the Association’s decision making and activities were directed by the Connecticut members. In the early 1970’s, the four major Western Mass member companies, Mitchell Machine, Hoppe Tool, Hutchins Tool and Banner Machine, decided to form their own chapter to assist the growing number of companies that were conducting business in Western Massachusetts. 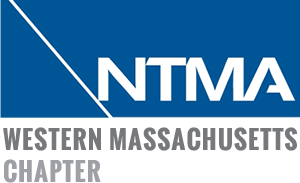 With assistance and support from the national office, the present Western MA Chapter began operations and developed a strong and supportive membership consisting of established and emerging precision machining companies. Early in their development, the Chapter witnessed the closing of the Springfield Armory, and the closing of the apprentice machining program operated by General Electric in Pittsfield, MA. These two companies had been the main pipeline for the skilled workers who became the machinists and toolmakers in the member companies of the Western MA Chapter. This action prompted the four charter members to work with the national office to acquire federal funding to open their own training school, and in the mid-1970’s the Western Massachusetts Precision Institute (WMPI) opened in Springfield. Under the administrative direction of the new Chapter, the Institute’s training activities produced a steady stream of trained entry level employees for the member companies throughout the 1980’s. During this period, the Institute moved to Springfield Technical Community College, and continued its funding relationship through NTMA. In the early 1990’s, federal funding was halted resulting in a separation from the national office, which had been the Institute’s conduit for funding since its inception. The Institute managed to secure state funding, moved to West Springfield, and continued to operate there until its closing in the late 1990’s. Since the closing of the Institute, the Chapter has continued to provide important services and benefits to its membership. Under the leadership of the officers, and a committed and dedicated Board of Directors, the Western Massachusetts Chapter of the National Tooling and Machining Association is an active and growing association that continues to be the catalyst and spokesperson for its membership, insuring that member companies have access to information and resources to assist them in managing and growing their business.